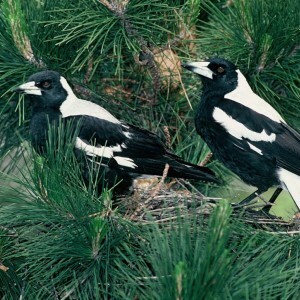 ﻿Bruce Goodman's "Fly from the nest"
Gretel was a baby magpie. Her little brother was Alecsandre. They were together in a nest near the top of a pine tree. Their mother and father spent all day bringing them food. Gretel loved it when a breeze blew the branches back and forth, back and forth. Wheeee! And then the time came to leave the nest. Alecsandre left first. Gretel stepped up to the edge of the nest. Alecsandre gave Gretel a push. She flew. But she wasn’t flying like an eagle at all, silly. She was flying like a magpie! “Another wretched magpie,” said Farmer Jasper aiming his gun.